We presented a poster on Mapping the network architecture of gap junctional coupling among parallel processing channels in the mammalian retina at the 2019 HHMI Connectomics meeting in Berlintoday. Downsampled PDF of poster here. Authors: Crystal L. Sigulinsky, James R. Anderson, Ethan Kerzner, Christopher N. Rapp, Rebecca L. Pfeiffer, Daniel P. Emrich, Kevin D. Rapp, Noah T. Nelson, J. Scott Lauritzen, Miriah Meyer, Robert E. Marc, and Bryan W. Jones. Abstract: Electrical synapses are fundamental components of neural networks. Gap junctions provide the anatomical basis for electrical synapses and are prevalent throughout the neural retina with essential roles in signal transmission. Gap junctions within and between the parallel processing channels afforded by retinal bipolar cells have been reported or predicted, but their roles, partners, and patterns remain largely unknown. Here, we took advantage of the high resolution of Retinal Connectome 1 (RC1) to reconstruct ON cone bipolar cells (CBCs) and map their coupling topologies. This entry was posted in Abstracts, Meetings, Retinal Circuitry, Ultrastructure and tagged bipolar cell, Bryan W. Jones, Christopher N. Rapp, connectome, connectomics, Crystal L. Sigulinsky, Daniel P. Emrich, Ethan Kerzner, gap junction, J. Scott Lauritzen, James R. Anderson, Kevin D. Rapp, Miriah Meyer, Noah T. Nelson, Rebecca L. Pfeiffer, Robert E. Marc on April 17, 2019 by bwjones. This abstract was presented at the 2014 Society for Neuroscience meeting in Washington D.C. by J. Scott Lauritzen, Crystal L. Sigulinsky, Danny P. Emrich, Joshua M. Dudleston, Noah T. Nelson, Rebecca L. Pfeiffer, Nathan R. Sherbotie, John V. Hoang, Jefferson R. Brown, Carl B. Watt, James R. Anderson, Bryan W. Jones and Robert E. Marc. 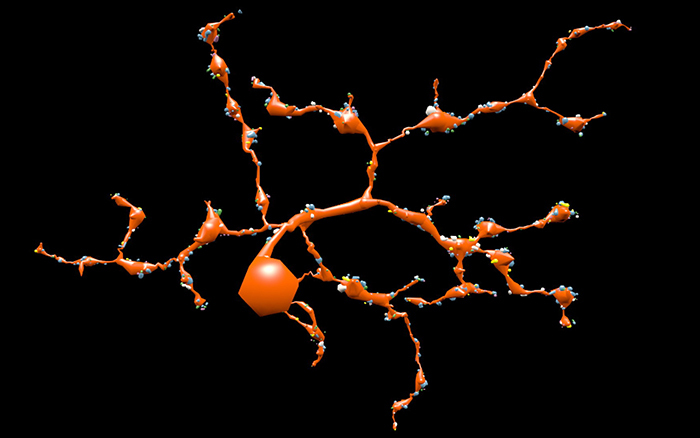 Purpose: Despite large-scale efforts aimed at mapping the mammalian nervous system, the entire synaptic cohort of a single mammalian neuron of any class has never been mapped. To this end we reconstructed all chemical and electrical synaptic partners of a single ON cone bipolar cell (ON CBC) in the inner plexiform layer (IPL) of the rabbit retina. We then searched all members of the same cell class for repeating network motifs and explored postsynaptic cell sampling topologies from this bipolar cell (BC). Methods: Cells in retinal connectome 1 (RC1) were annotated with Viking viewer, and explored via graph visualization of connectivity and 3D rendering (Anderson et al., 2011 J Microscopy). Small molecule signals in RC1, e.g. GABA, glycine, and L-glutamate, combined with morphological reconstruction and connectivity analysis allow robust cell classification. The default resolution of RC1 is 2.18nm/pixel, however goniometric recapture at 0.273 nm/pixel was performed as needed for synapse verification. Results: ON CBC 593 is one of 20 BCs of this class in RC1, the axonal arbors of which tile with gap junctions between nearest neighbors at their distal axonal tips. ON CBC 593 contains 194 ribbons, 274 postsynaptic densities, 20 gap junctions, and 66 conventional synapses, for a total of 554 synaptic connections. Twenty ganglion cells sample the glutamatergic output. ON CBC 593 is presynaptic to 262 amacrine cell (AC) processes, and is postsynaptic to 228 AC processes. Of these, 33% form reciprocal connections. We approximate that ON CBC 593 forms synapses with 50 distinct ACs. ON CBC 593 is routinely pre- and postsynaptic to within-class, cross-class, feedback, and feedforward inhibition motifs, including 1 instance of OFF-ON crossover inhibition. ON CBC 593 forms 12 gap junctions with at least 2 AII ACs, 7 with 5 ON CBCs, and 1 with itself. We searched for repeating network motifs across all ON CBCs of this class in RC1. Thus far, 80% of these form in-class inhibitory motifs, and 75% form cross-class inhibitory motifs. 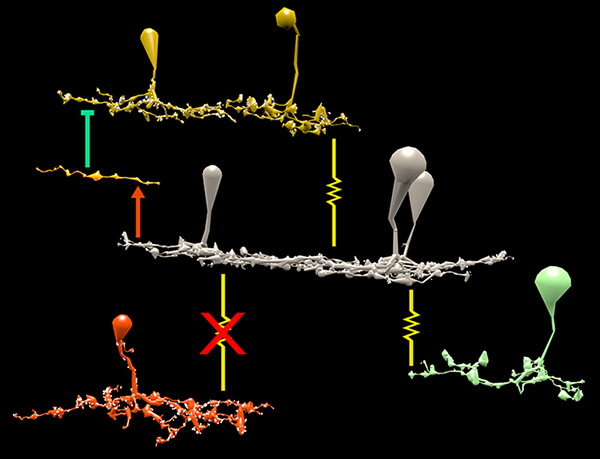 All ACs and GCs discovered to contact multiple branches of ON CBC 593 form synapses on every branch. Conclusions: An individual bipolar cell is inherently multi-kinetic, receiving inhibition driven by all ON CBC classes, sharing these signals via gap junctions with ON CBCs of the same class, and driving inhibition of all ON CBC classes. This constitutes a substrate for multi-channel coordination throughout the IPL, and predicts multi-kinetic BC responses. The results establish a normative framework against which members of the same and different classes may be compared, and foster interpretation of BC physiological behavior under different stimulus regimes. This entry was posted in Uncategorized and tagged bipolar cell, Bryan W. Jones, Bryan William Jones, BWJones, Carl B. Watt, connectome, Crystal L. Sigulinsky, Danny P. Emrich, inner plexiform layer, J. Scott Lauritzen, James R. Anderson, Jefferson R. Brown, John V. Hoang, Joshua M. Dudleston, Nathan R. Sherbotie, Noah T. Nelson, ON cone bipolar, Rebecca L. Pfeiffer, retina, Robert E. Marc on November 18, 2014 by bwjones. 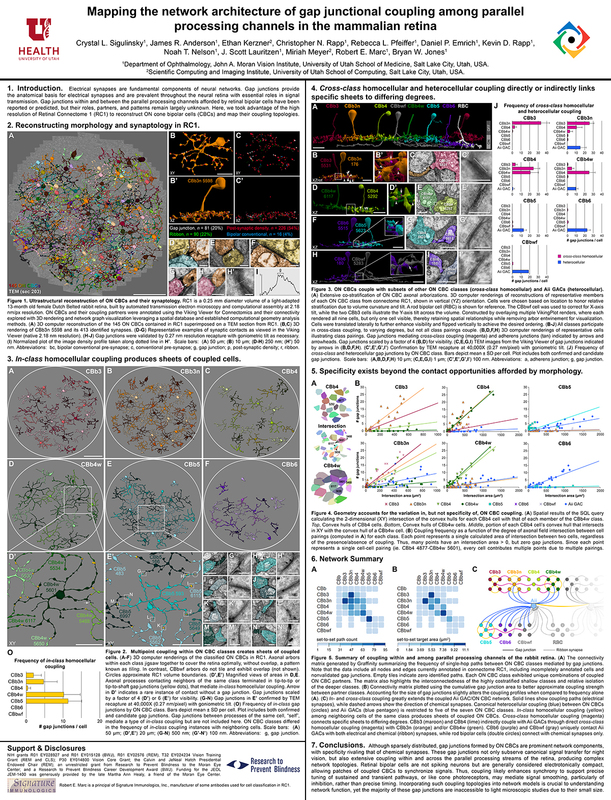 We have a new publication in Frontiers in Neuroscience, The AII Amacrine Cell Connectome: A Dense Network Hub. Authors are Robert E. Marc, James R. Anderson, Bryan W. Jones, Crystal Sigulinsky and J. Scott Lauritzen. Abstract: The mammalian AII retinal amacrine cell is a narrow-field, multistratified glycinergic neuron best known for its role in collecting scotopic signals from rod bipolar cells and distributing them to ON and OFF cone pathways in a crossover network via a combination of inhibitory synapses and heterocellular AII::ON cone bipolar cell gap junctions. Long considered a simple cell, a full connectomics analysis shows that AII cells possess the most complex interaction repertoire of any known vertebrate neuron, contacting at least 28 different cell classes, including every class of retinal bipolar cell. Beyond its basic role in distributing rod signals to cone pathways, the AII cell may also mediate narrow-field feedback and feedforward inhibition for the photopic OFF channel, photopic ON-OFF inhibitory crossover signaling, and serves as a nexus for a collection of inhibitory networks arising from cone pathways that likely negotiate fast switching between cone and rod vision. Further analysis of the complete synaptic counts for five AII cells shows that (1) synaptic sampling is normalized for anatomic target encounter rates; (2) qualitative targeting is specific and apparently errorless; and (3) that AII cells strongly differentiate partner cohorts by synaptic and/or coupling weights. The AII network is a dense hub connecting all primary retinal excitatory channels via precisely weighted drive and specific polarities. Homologs of AII amacrine cells have yet to be identified in non-mammalians, but we propose that such homologs should be narrow-field glycinergic amacrine cells driving photopic ON-OFF crossover via heterocellular coupling with ON cone bipolar cells and glycinergic synapses on OFF cone bipolar cells. The specific evolutionary event creating the mammalian AII scotopic-photopic hub would then simply be the emergence of large numbers of pure rod bipolar cells. This entry was posted in Connectomics, Publications, Retinal Circuitry and tagged AII amacrine cell, Bryan Jones, Bryan W. Jones, BWJones, connectome, connectomics, Crystal Sigulinsky, J. Scott Lauritzen, James R. Anderson, retina, retinal circuitry, Robert E. Marc on September 4, 2014 by bwjones. We have a new publication in IEEE, A Multi-Scale Computational Model For The Study Of Retinal Prosthetic Stimulation. Authors are: Kyle Loizos, Gianluca Lazzi, J. Scott Lauritzen, James R. Anderson, Bryan W. Jones and Robert E. Marc. Abstract: An implantable retinal prosthesis has been developed to restore vision to patients who have been blinded by degenerative diseases that destroy photoreceptors. By electrically stimulating the surviving retinal cells, the damaged photoreceptors may be bypassed and limited vision can be restored. While this has been shown to restore partial vision, the understanding of how cells react to this systematic electrical stimulation is largely unknown. Better predictive models and a deeper understanding of neural responses to electrical stimulation is necessary for designing a successful prosthesis. In this work, a computational model of an epi-retinal implant was built and simulated, spanning multiple spatial scales, including a large-scale model of the retina and implant electronics, as well as underlying neuronal networks. This entry was posted in Publications and tagged Admittance, Bryan Jones, Bryan William Jones, Computational modeling, Gianluca Lazzi, Integrated circuit modeling, J. Scott Lauritzen, James R. Anderson, Kyle Loizos, Mathematical model, neurons, Prosthetics, retina, Robert E. Marc on August 31, 2014 by bwjones. This abstract was presented at the 2014 FASEB Summer Research Conference in Saxtons River, Vermont by J. Scott Lauritzen, Crystal L. Sigulinsky, Noah T. Nelson, Nathan R. Sherbotie, Danny P. Emrich, Rebecca L. Pfeiffer, Jefferson R. Brown, John V. Hoang, Joshua M. Dudleston, Carl B. Watt, Kevin Rapp, Marguerite V. Shaw, Jia-Hui Yang, James R. Anderson, Bryan W. Jones and Robert E. Marc. Purpose: Functional mapping in tiger salamander shows that bipolar cell (BC) projective fields far exceed their axonal fields, and directly implicates wide-field GABAergic amacrine cells (wf γACs) and gap junctions (Asari & Meister, 2014). Strikingly, single BCs exert differential effects on functionally distinct ganglion cells (GCs), likely achieved by privatized amacrine cell (AC) presynaptic inhibition to specific BC-GC synaptic pairs (Asari & Meister, 2012). 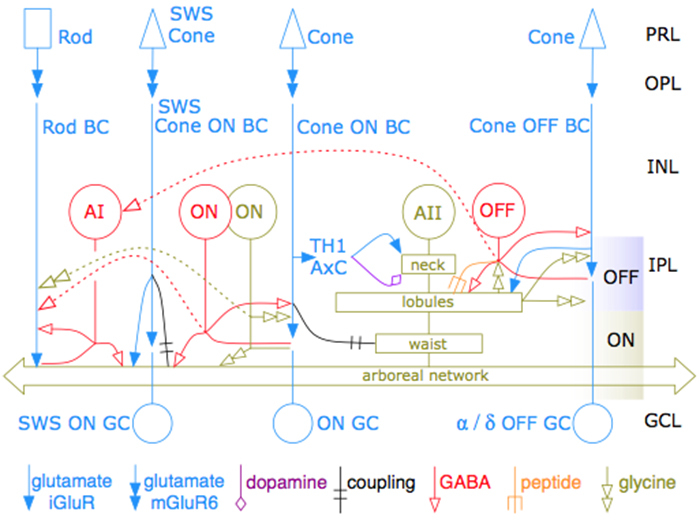 To address whether BC projective fields in the mammal are equally broad, wf γAC- and gap junction-dependent, and GC type unselective, we reconstructed all electrical and chemical synaptic partners of a single ON cone BC in the inner plexiform layer of the rabbit retina, and searched BC-GC synaptic pairs for differential synaptic inhibition. 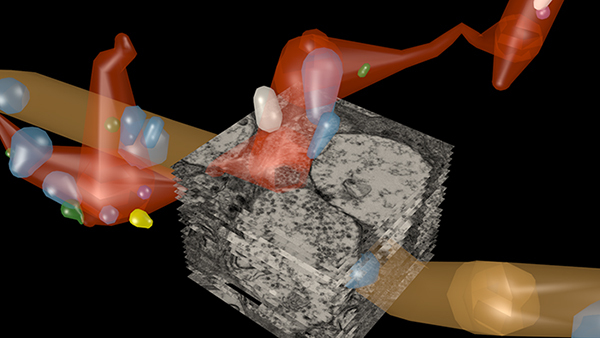 Methods: Cells in retinal connectome 1 (RC1) were annotated with Viking viewer, and explored via connectivity visualizations and 3D rendering (Anderson et al., 2011). Small molecule signals embedded in RC1, e.g. 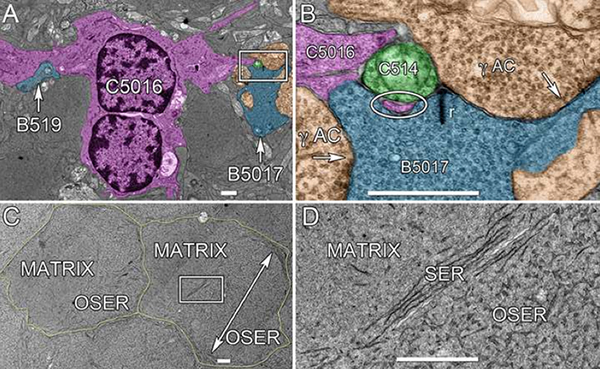 GABA, glycine, and L-glutamate, combined with morphological reconstruction and connectivity analysis allow robust cell classification. We used the MacNeil et al. (2004) rabbit BC classification scheme. Results: CBb5w 593 is one of 20 ON cone BCs of this class in RC1. This CBb5w is presynaptic to 17 distinct GCs and 262 AC processes, and postsynaptic to 228 AC processes. The majority of these ACs are wf γACs. We estimate this BC forms synapses with 50 unique ACs. Asari & Meister (2014) found that single bipolar cell projective fields range up to 1 mm, far beyond a BC axonal field, and differentially drive multiple classes of GC. We discovered BC-BC within- and cross-class coupling and lateral inhibition that construct sign-conserving and sign-inverting projective fields to many distinct ganglion cell classes across the entire 0.25 mm diameter of RC1, much greater than a 60 µm BC axonal field. Cross-class projections access a broader set of GCs than expected from in-class projections alone. The BC-BC coupling is independent of BC-AII AC coupling. 94% of the CBb5w 593 BC-GC synaptic pairs receive feedback inhibition within the varicosity of the ribbon, but the number of feedback synapses is highly variable (coefficient of variation = 0.81). 35% of the BC-GC pairs receive feedforward inhibition within 2 microns of the postsynaptic density. Conclusions: Mammalian BCs use novel cross-class topologies to distribute signals to a wide range of GCs and establish projective fields similar to those discovered in non-mammalian species. BC-BC within- and cross-class coupling and lateral inhibition via wf γACs establish sign-conserving and sign-inverting projective fields, respectively, up to 1 mm diameters. BC-GC synaptic pairs overwhelmingly employ feedback vs. feedforward inhibition to modulate signaling, and the numbers of feedback synapses are highly variable across these pairs, accounting for privatized and differential GC responses to the same BC drive. This entry was posted in Abstracts, Retinal Circuitry and tagged amacrine cell, bipolar cell, Bryan W. Jones, Carl B. Watt, connectomics, Crystal L. Sigulinsky, Danny P. Emrich, ganglion cell, J. Scott Lauritzen, James R. Anderson, Jefferson R. Brown, Jia-Hui Yang, John V. Hoang, Joshua M. Dudleston, Kevin Rapp, Marguerite V. Shaw, Nathan R. Sherbotie, Noah T. Nelson, projective fields, Rebecca L. Pfeiffer, Retinal Connectomics, Robert E. Marc on July 1, 2014 by bwjones. This entry was posted in Abstracts, Connectomics, Retinal Circuitry and tagged amacrine cell, bipolar cell, Bryan W. Jones, Carl B. Watt, connectome, connectomics, Crystal L. Sigulinsky, J. Scott Lauritzen, James R. Anderson, John Hoang, Nathan Sherbotie, Noah T. Nelson, Rebecca L. Pfeiffer, retina, Robert E. Marc, small world network design, synapse on May 6, 2014 by bwjones. We have a new publication, Retinal connectomics: Toward complete, accurate networks in Progress in Retinal and Eye Research. Authors are: Robert E. Marc, Bryan W. Jones, Carl B. Watt, Crystal Sigulinsky, James R. Anderson and J. Scott Lauritzen. Connectomics is a strategy for mapping complex neural networks based on high-speed automated electron optical imaging, computational assembly of neural data volumes, web-based navigational tools to explore 1012-1015 byte (terabyte to petabyte) image volumes, and annotation and markup tools to convert images into rich networks with cellular metadata. These collections of network data and associated metadata, analyzed using tools from graph theory and classification theory, can be merged with classical systems theory, giving a more completely parameterized view of how biologic information processing systems are implemented in retina and brain. Networks have two separable features: topology and connection attributes. The first findings from connectomics strongly validate the idea that the topologies complete retinal networks are far more complex than the simple schematics that emerged from classical anatomy. In particular, connectomics has permitted an aggressive refactoring of the retinal inner plexiform layer, demonstrating that network function cannot be simply inferred from stratification; exposing the complex geometric rules for inserting different cells into a shared network; revealing unexpected bidirectional signaling pathways between mammalian rod and cone systems; documenting selective feedforward systems, novel candidate signaling architectures, new coupling motifs, and the highly complex architecture of the mammalian AII amacrine cell. This is but the beginning, as the underlying principles of connectomics are readily transferrable to non-neural cell complexes and provide new contexts for assessing intercellular communication. This entry was posted in Publications and tagged Bryan W. Jones, Carl B. Watt, connectome, connectomics, Crystal Sigulinsky, J. Scott Lauritzen, James R. Anderson, Marclab, Moran Eye Center, research, Retinal Connectomics, Robert E. Marc, science on September 13, 2013 by bwjones.